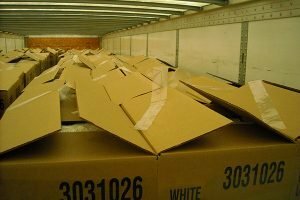 In theory, the case sealing process is simple: cartons go in, tape is applied, and sealed cartons are palletized for transport or storage. But, in reality, application of packaging tape isn’t an exact science. It’s a delicate balance between the packaging machine, corrugated box, tape applicator and packaging tape – all of which must work together to ensure cartons are closed securely to keep products inside safe. Several factors – ranging from environmental conditions to tape stretch – can impact the quality and reliability of the case seal, as well as the uptime of the packaging line. So how can manufacturers enhance the performance of their tape and packaging equipment? One solution is to give the system more reliability. And that can be done with Folded-Edge® Technology. Folding the edges of the tape as it’s applied essentially kisses the adhesive together to produce an edge that’s double the thickness of the tape. This creates a more uniform, stronger tape edge, which enhances the reliability of the seal, the productivity of the case sealing process, and even the safety of tape removal for those unpacking carton contents. Want to learn more about the benefits of Folded-Edge Technology, available exclusively on ShurSEAL Packaging Solutions? Read our Double-Down on Case Sealing Success article.